MS Adventures – How Do You Pace Yourself If You Don’t Know Your Limits? Today I’m having one of those days. The ones where you wake up cranky and sore and you don’t want to be nice to anyone. I kinda feel like I’ve been hit all over the head with a frying pan – puffy in some places and flat in others. I just tried to be “normal” yesterday! Why do I feel like this today??? I volunteered to be on a friends’ team for a competition called “Winterfest.” It’s put on by the town, and has different types of competitions that all need to be completed as a team. Friday night was fun, there was a karaoke air-band “Mystery Event,” a “run and grab the paper bag and do what the note on it says” relay, and another I don’t remember. I felt fine when I got home afterwards, so I was hopeful for Saturday. Saturday was a LOT more physical – we had to build a “Truely Canadian” ice sculpture, (actually, carve it out of a large hill of hard-packed snow,) start a fire from a log we had to cut and split ourselves, (I didn’t do that one – too many pointy objects!) a “do the stuff on the list and take pictures” scavenger hunt, and a crock-pot competition that I helped with by eating the results. 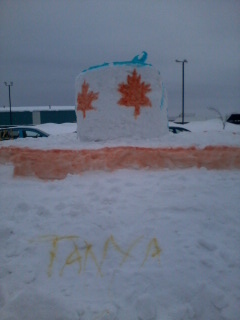 Winterfest 2013 Snow Sculpture – Front. Yes, it’s a beer can with a tab on top. It’s Truely Canadian! You can’t tell, but it’s a 4 foot tall can poking out of a 4 foot tall maple leaf shaped ice bucket. With Moose. Mooses? Meese? 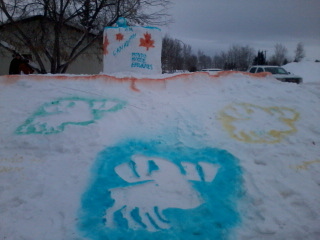 Winterfest 2013 Snow Sculpture – side. We wrote our names in yellow snow. Because if you’ve grown up in a small Northern Canadian town, you’ve tried it for real. Other than the ice sculpture, I really didn’t do much, but with the -20 degree Celsius weather, even the sculpture was too much! I kept thinking “No one who isn’t dealing with this can possibly understand how much effort it takes to pretend to be normal.” I was feeling a bit sorry for myself, when I realized that EVERYONE on the team was dealing with something! Heck, we lost 3 out of 9 people overnight due to illness, and another friend had to leave at lunch on Saturday because his Krohn’s Disease was acting up. I tell you, we’d have WON that competition if we could have added points for every diagnosed condition our various team members were dealing with! As it was, we didn’t exactly win. We actually got the “If You’re Not First, You’re Last” Booby Prize. I personally considered it a win just for being there, and staying for the entire competition! I think I convinced the rest of the team to look at it that way, and we may even make ourselves a trophy anyway. But then what? I’m not going to hole up in a cave and NOT spend time with my friends. I mean, we’re ALL dealing with repercussions of some sort today. Do I just stop trying? That’s not me. Even a Booby Prize outranks everyone else who didn’t compete! But my limits have changed, my “normal” has changed, and I’m still not sure what it’s changed to. How do I find my new limits if I don’t push at them? Unfortunately, so far every time I’ve pushed, I’ve pushed too far. I’ve never been good at restraint! I’m really struggling with an “all or nothing” mindset. I mean, I feel fine when I do NOTHING, but I get bored and feel guilty for doing nothing, and I have to do SOMETHING. So I do SOMETHING and overextend. I’m just not sure how to find smaller SOMETHINGS to practice on. So, any thoughts or advice from anyone out there? Have you found your new line, your new boundaries, your new limits? Are you still pushing? What small “somethings” do you strive for? How do you pace yourself in your new world? I’d love to hear some ideas! Just click the “Comment” button below and share some of your hard-earned knowledge!